The Loch Ard Gorge is part of Port Campbell National Park, Victoria, Australia, about three minutes' drive west of The Twelve Apostles. The gorge is named after the clipper ship Loch Ard, which ran aground on nearby Muttonbird Island on 1 June 1878 approaching the end of a three-month journey from England to Melbourne. Of the fifty-four passengers and crew, only two survived: Tom Pearce, at 19 years of age, a ship's apprentice, and Eva Carmichael, an Irishwoman emigrating with her family, at 19 years of age. According to memorials at the site, Pearce was washed ashore, and rescued Carmichael from the water after hearing her cries for help. Pearce then proceeded to climb out of the gorge to raise the alarm to local pastoralists who immediately set into plan a rescue attempt. After three months in Australia Carmichael returned to Europe. Four of her family members drowned that night. Pearce was hailed as a hero, and continued his life living until age 49. He is buried in Southampton, England. This image belongs to the travel and nature stock photo library. This stock photo of Loch Ard Gorge in Black and White is available for licensing for commercial and editorial uses including websites, blogs, books, magazines, brochures and advertising. Restrictions may apply for images which contain third party copyrighted material or sensitive subjects. Photos of artwork are for editorial use only. 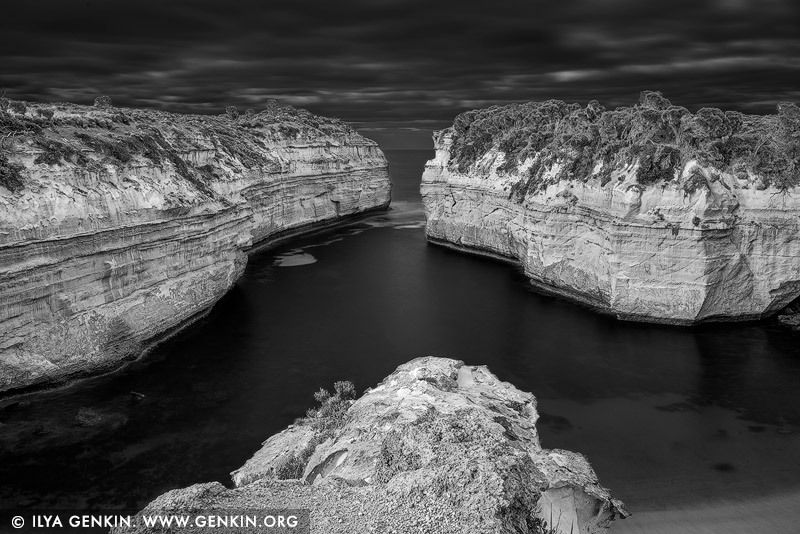 This image id APOST-0036 of Loch Ard Gorge in Black and White, is copyrighted © by Ilya Genkin. This is not a public domain image.